Do you want to be inspired to learn Latin and science with your children? Do you want to train your children to be self-motivated? Do you want to provide worthy role models? 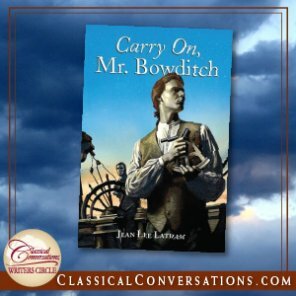 If so, then simply turn to an enduring classic in children’s literature: Carry On, Mr. Bowditch by Jean Lee Latham. It is one of the best novels I read aloud with my family. It tells the story of a young man in colonial America—Nathaniel “Nat” Bowditch—who is bright and eager to attend his local grammar school. For a very short time, he flourishes in school, especially when working with numbers. Soon after, Nathaniel’s family needs his help to provide, and his father apprentices him to one of the many shipping-related businesses in Salem, Massachusetts. His hopes of completing his grammar school education and matriculating to Harvard “becalmed,” Nat resolves to work hard at business during the day and work equally hard at educating himself during the evenings. A wise mentor advises him to “sail by ash breeze;” in other words, he must apply himself to the oars in the absence of the winds of good fortune. With limited access to books, Nat comes across a New Testament with facing pages in Latin and English. He sets himself the challenge of learning Latin by parsing out verses of Scripture one painstaking word at a time. After persistent study, he masters the Latin language (note that Latin is one of the lynch pins of Classical Conversations’ Challenge programs). Next, he tackles Newton’s Philosophiæ Naturalis Principia Mathematica, a title which is Latin for “Mathematical Principles of Natural Philosophy.” This scientific classic was published in 1687 and contains Newton’s Laws of Motion which we memorize in Foundations Cycle 2. In order to approach this weighty book, Nat must first translate it from Latin to English. Although not the easiest way to become a Latin scholar, this method is certainly effective. Finally, after translating Newton’s Principia and working all of Newton’s original calculations, Nat is able to make his mark on the world. Using his hard-earned knowledge of math and science, Nat begins an overhaul of the navigational tables used by sailors in his day. Surprisingly, he finds and corrects many errors which will prevent future shipwrecks. Latham’s book encourages excellent character qualities in young people such as perseverance under difficult conditions, persistence in mastering academic material, and presentation of one’s gifts and labors in service to society. Along the way, your children will catch a glimpse of the stages of classical education as Nat progresses from knowledge to understanding to wisdom. They will have a clearer understanding of life in early colonial America. They may have a deeper appreciation for the richness of their own opportunities in modern America. Perhaps they will be inspired to tackle a large project of their own and see it through to the very end. So, curl up on the couch and slip away on a learning adventure.